1, 1, 1, 2-Tetrafluoroethane is commonly known as R134a, HFC134a and HFC-134a. It is a kind of colorless, non-toxic and non-burning chemical. It is insoluble in water (67mg/L, 25 ℃ ) but soluble in ether with its potential value of ozone depletion being 0. Its thermodynamic property is very similar as CFC-12 while having its security being comparable to CFC-12, and thus has been recognized as the best substitute of CFC-12. Although there are some greenhouse effect for HFC-134a (HGWP = 0.28), this doesn’t affect it to become the primary-choice ODS (Ozone Depleting Substances) substitute. 1, 1, 1, 2-tetrafluoroethane (HFC-134a or HFA-134a) is a new generation of non-chlorofluorocarbon compounds as pharmaceutical excipients. It is mainly used as the propellant agent contained in the mist agent during the treatment of asthma and chronic respiratory disorders disease. Compared with the traditional CFC class pharmaceutical propellant, the advantage of HFC-134a is free of chlorine atom and thus having zero ODP (ozone depletion potential) value and GWP value (global warming potential) without depleting ozone and generating photochemical smog and is chemically inert and toxicologically safe. It is also a kind of environmental friendly pharmaceutical excipients and is also currently used as the major substitute of CFC contained in aerosol that is ozone-depleting. Figure 1 is the chemical structure formula of tetra-fluoroethane. Tetrafluoroethane (R-134a) is the most widely used low or moderate-temperature refrigerant. Owing to the excellent overall performance of the tetrafluoroethane (HFC-134a), it has become a very effective and safe substitute for CFC-12 products. It is mainly applied to various areas taking advantage of R-12 (R12, Freon 12, F-12, CFC-12, Freon 12, dichlorodifluoromethane) refrigerant including: refrigerators, freezers, water dispensers, auto air conditioning, central air conditioning, dehumidifiers, cold storage, commercial refrigeration, ice machines, ice cream machine, refrigeration condensing units and other refrigeration equipment. It can also be applied to fields of aerosol propellants, medical aerosols, pesticides propellant, polymer (plastic) physical foaming agent, and protection gas of magnesium alloy. While tetrafluoroethane refrigerant (R-134a) is the most popular choice as alternative of the feron R12 for being applied to the newly installed refrigeration equipment, owing to that R134a is different from R12 in physical and chemical properties, theoretical cycle performance as well as the applied compressor oil, for the after-sales repair of the refrigerated equipment with initial installation of R12 refrigerant refrigeration equipment repairs, if you need to add or replace the refrigerant, you have no choice but still add R12. Usually people can‘t directly apply tetrafluoroethane refrigerant (R-134a) to replace R12 (That is usually called “no cataclysmic replacement”). Synthetic route of the raw material of 1, 1, 1, 2-tetfluoroethane: it has been reported of as much as several dozens of major synthetic routes. Among them, the major synthetic route is shown as the figure. For various synthetic routes, considering comprehensively of the sources of raw materials, production processes and waste treatment and other factors, only two routes of raw materials, trichlorethylene and tetrachlorethylene have practical value of industrial production. In the actual industrial production, trichlorethylene raw material routes, due to its simple reaction step and small amounts of by-products, is preferentially recommended. The advantage of liquid Freon is following the traditional production methods with simple production process and relatively mature technology. In 1982, DuPont ha applied liquid fluorination for the manufacturing of HFC-134a. However, at high temperature, due to the emergent corrosion of the equipment and the difficulty in conducting continuous production, this method is still in the stage of small-range laboratory test. 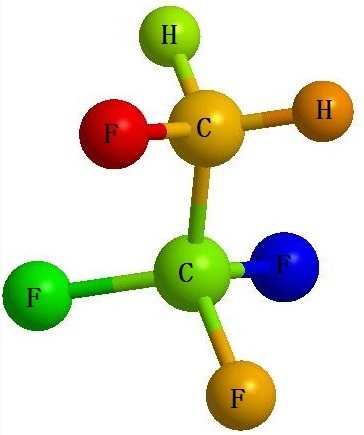 Shanghai Institute of Organic Chemistry Research has applied Cl (CF2CF2) 4OCF2SO2F (perfluoroalkoxy sulfonyl fluoride) as a catalyst and have reaction in the KF solution at the pressure of 230e and 12.5MPa for 2h to give HC-134a with the yield being 88%. The reaction equation is: CF3CH2Cl + KF---CF3CH2F + KCl, compared with the DuPont method, the CAS Shanghai Institute of Organic Chemistry had achieved lower reaction temperature so that corrosion and byproducts have been effectively controlled, making it possible to conduct the continuous production. However, it is still difficult to achieve industrial production using this method in short term. The advantage of gas-Liquid method is that at the first-step reaction, it can almost take advantage of all the equipment and technology, liquid-phase washing, alkaline washing and drying processes for the original production of Freon products. This can effectively reduce the energy consumption. This process, for the old plant of the original production of CFCs, it is a doable route. However, the second step is equilibrium reaction with low gas one-way conversion rate and short duration life of the catalyst and other shortcomings. Therefore, this step restricts the vapor-liquid phase process for being applied to process route for large-scale production. Gas phase method applies trichlorethylene (TCE) and anhydrous hydrogen fluoride (HF) for reaction in the action of a chromium-containing catalyst. The first step of addition and substitution reactions generates HCFC-133a, and then it is further reacted with HF in the presence of chromium-based catalyst to generate the finished product, tetrafluoroethane (HFC-134a) at a temperature of 350~380 ℃. The second-stage reaction of gas-phase method is relative difficult with the conversion rate being generally only about 20%. Therefore, in the industrial production, people mostly adopts continuous cycle method to have the large amount of raw materials be recycled to reduce the toxic and hazardous intermediate products as well as improve the overall yield. Gas-phase method has a lot of advantages including easily controllable reaction process, small amount of waste pollution and easily being applied for large-scale continuous production. Currently gas-phase method has gradually replaced liquid-phase method and gas phase-liquid phase method to become the mainstream of the world's production of tetrafluoroethane (HFC-134a). Technical measures: it should be manipulated in a well-ventilated place. Upon high pressure condition, make sure that the internal pressure of the reaction apparatus does not exceed the cylinder pressure. For safety purpose, the gas flow path should be installed with a check valve. Do not remove the check valve before running out of the content. Wear protective equipment when handling. Wash hands and face thoroughly after handling. Handling Precautions: Avoid contact with skin, eyes and clothing. Storage conditions: Avoid the sunshine. Store it in a well-ventilated place. Do not expose it to environment above 40 ℃. Locked up the place where it is stored. Store it away from incompatible materials such as oxidants. It can be used as the refrigerant in fridge and refrigerator and automotive air conditioning as well as the aerosol propellant of medicine and cosmetics. It can be used as animal-used antibiotic with stable quality. It is not easy to produce drug resistance and cross-resistance and has a high antibacterial activity in vivo. It is mainly applied to the treatment of E. coli disease in livestock and poultry, cholera, dysentery, chronic respiratory infections and other diseases.